Life as a Royals fan was not a fun, enjoyable thing for the better part of the last 30 years. But something special happened two years ago, and for the long suffering group and the many newcomers; the grass at Kauffman Stadium has never smelt as sweet and the wins have never been more plentiful. The defending World Champions Kansas City Royals seems like an absurd thing to say, but it is true. What is even more impressive is the fact they are the 2-time American League Champions coming off back to back World Series appearances. So what will 2016 bring? Another AL Central Title? Another AL Pennant? Or perhaps another World Series Championship? The Royals seem to be the exact same team of the past two years. They bring back the core of their success, dominant pieces in their bullpen and young, incredible fielders. Where they have been uncertain before, they are uncertain again with the lack of a true reliable ace and not much, if any power in the middle of the lineup. So will they achieve similar results. Lets break down the 2016 Royals. The Royals will return with the same infield as the past two seasons. Eric Hosmer has two more years with the Royals before he will be eligible for a major, superstar contract that is surely to await him and take him from Kansas City. Hosmer is coming off a season where he hit .297 with 18 home runs and 93 RBIs. The potential he has promised started to show last season, as he shined in the postseason yet again. But Hosmer is due for a true breakout season. He has all the tangibles to hit over .300, over 25 home runs and over 100 RBIs. Hosmer is by far the best field first baseman as he has won back to back gold gloves, but Hosmer is primed to become one of the best hitting, dominant 1B at the plate as well. Mike Moustakas finally overcame his struggles last season hitting .284 with 22 home runs and 82 RBIs. This was a huge improvement as he was a .240 lifetime hitter before. An incredible 2014 Postseason catapulted Moose to his success in 2015. If Moose can build on his achievements of last season, he could have the ability to be as good a hitter as Josh Donaldson. A renewed attack of hitting to the opposite field led him to his success and you would have to assume he will only get better at it. Alcides Escobar struggled at the plate for most of the regular season, but as to be expected for the Royals, he suddenly became Ozzie Smith in the playoffs. Esky hit .257 last year with 3 home runs and 47 rbis. Esky is not your prototypical leadoff hitter but the Royals just win when he is there. For the Royals to compete with the reloaded Tigers lineup they are going to need to find a true leadoff hitter. Will Esky be that? Time will tell. And rounding out at second base is Omar Infante. Infante suffered an injury last season which made him miss the final month of the season and all of the postseason where he was replaced by the largely effective Ben Zobrist. Infante was the Royals worst player last season, hitting .220, with two home runs and 44 rbis. The Royals have Infante for two more years and are in a contract they can not get out of. That said 20 year old Raul Mondesi is being primed to play 2B as he was the Royals #1 SS prospect and the leash might be short for Infante if he shows little to no improvement. The Royals shocked the baseball world and many of its fans by resigning Alex Gordon. Gordon was considered one of the most sought after free agents and that is a field the Royals tend to not get involved with. But sure enough the Royals #2 overall draft pick from 2005 will return and most likely end his carer as a Royal. Gordon is coming off a season where he hit .271 with 13 home runs and 48 RBIs. Gordon missed several months with a bad groin injury, but returned for several crucial at bats in the postseason including the game tying home run in the bottom of the ninth in Game 1 of the World Series which might have set the table for the teams championship. Lorenzo Cain had his first injury free season last year and the Royals will need him to stay healthy as he makes huge strides to being a superstar. Cain hit .307, with 16 home runs and 72 RBIs as he finished in the top 3 for AL MVP voting. Cain became much more than an incredible defensive fielder but perhaps the Royals best hitter. Cain is primed and ready to be one of the best players in all of baseball. Right field is a big question mark for the Royals as they chose not to resign Alex Rios. At the moment it seems to be a platoon between Jarrod Dyson and Paolo Orlando. While the Royals have options in the minor leagues with 2011’s first round draft pick Bubba Starling and power hitting Brett Eibner. There are zero questions here for the Royals. Salvador Perez is the gel, the glue, and the backbone of the Royals. Not only is he the best defensive catcher in baseball, but he made huge strides at the plate and his attitude and leadership is a huge reason why the Royals have achieved so much success. Salvy is coming off a season where he hit .260, 21 home runs and 70 RBIs and a season where he won the World Series MVP. The Royals traded for Tony Cruz from the Cardinals and still have Drew Butera on the roster to backup Salvy. Here are where the questions lie with this team. After losing Johnny Cueto whom they acquired mid season, they lack a true ace. It looks as if Yordano Ventura will be their opening day starter for the second year in a row. Yordano had a very eventful season, including meltdowns, suspensions, injuries and solid playoff starts. Yordano went 13-8 with a 4.08 ERA and a 1.30 WHIP. There is a lot of room for improvement for Yordano as he is still very young. He has the talent to be one of the best pitchers in baseball, time will tell if he has the mentality. Edinson Volquez became the Royals best pitcher in October last year and a huge reason they won the World Series. Volquez was largely inconsistent during the Regular season going 13-9 with a 3.55 ERA and a 1.31 WHIP. Volquez would have solid quality starts, but also several games where he would lose complete command of the plate. But you have to think his World Series run might have given him the confidence he needed that he can be a dominant pitcher. He is a solid #2 pitcher in a rotation. The Royals signed Ian Kennedy to take the role as their third starter. Kennedy played for the San Diego Padres last season going 9-15 with a 4.28 ERA and a 1.30. Kennedy is the perfect addition for the Royals. Every year the Royals find a pitcher who struggled the year before and the relocation to the pitcher friendly Kauffman Stadium and with the stellar defense, we have seen those pitchers succeed like Volquez and Jason Vargas who will miss this season after Tommy John surgery. The rest of the rotation will most likely be filled out by Danny Duffy, Kris Medlen or Chris Young. Young came up huge in the postseason with a massive extra inning outing in Game 1 of the World Series and great starts against the Blue Jays. Duffy, like Ventura, has the talent but has yet to put it all together. He is due for a season that will completely define who he will be. Kris Medlen was great in his few starts as he found himself after returning from Tommy John. Medlen is sure to play a huge part in the rotation. The absolute core and reason for the Royals resurgence. The Royals will bring back just about everyone from their championship team. Wade Davis may be the single most responsible person for the Royals last two seasons. He will take over the closer spot full time as Greg Holland recovers from Tommy John surgery. Davis was the best relief pitcher in all of baseball last year going 8-1 with a 0.94 ERA and 17 saves. In the postseason he was 1-0 with four saves and he did not allow a single run. Kelvin Herrera will be back and has been just as dominant as Davis for the past few years. The Royals resigned their old closer Joakim Soria which was a very interesting signing. He will most likely serve as the setup man while Herrera stays in the 7th. Luke Hochevar got better as the year went on after returning from Tommy John, and got the win in the decisive World Series game. The Royals will also get back left hander Tim Collins from Tommy John. The AL Central used to be a joke about five years ago with only one contending team. Now you can make an argument for any of the five. The Twins are young, but have some of the greatest prospects in baseball, the White Sox made some big moves this offseason and still have Chris Sale, the Indians were supposed to break through last season but didn’t put it together until too late, while the Tigers might have the scariest lineup in all of baseball. All of these reasons make it very difficult to feel confident about picking the Royals to repeat here. But, this is pretty much the exact same team as the past year. Expert projections have them to finish 82-80 and 2nd or 3rd in the division. This is the best thing that can happen to the Royals. They excel by being disrespected and having people not believe in them. The window for these Royals is open for the next two years. 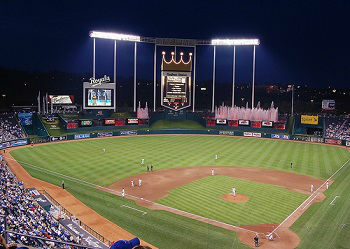 While we aren’t ready to pick them to win another World Series I believe they should be favored to win the AL Central. They have been there before they have the pieces to get their again and general manager Dayton Moore has shown the ability to make the moves to get them back. I like the Royals to repeat as AL Central Champions and perhaps as American League Champions but I believe this is the National Leagues year to win the title.